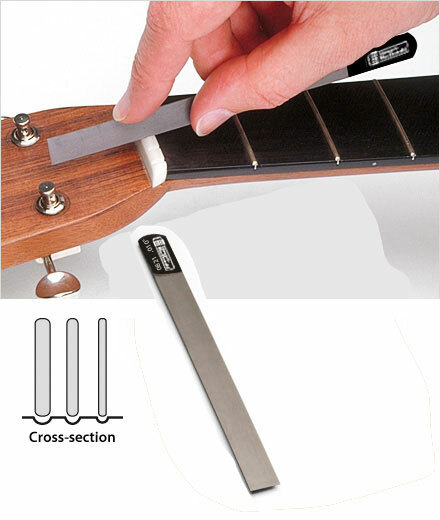 Our tempered edge-cut nut files produce round-bottom slots, to ensure that the strings seat properly in the nut without buzzing. Each chrome-alloy steel file has twin 4" cutting edges. Among our most popular tools, these professional files help you get the job done quickly and correctly. Standard widths: .010" thru .056"
Nut files for bass: .065" thru .105"
TIP: A nut file can be rocked back and forth while cutting, to form a slightly wider slot when necessary. What files do I need? Choose nut slotting files that are the same size or no more that a few thousands larger than your individual string gauges. A smaller file can also be rocked side-to-side to widen a slot to the desired size. For example, you can cut a .043" slot with a .042" file by moving it around a bit. Click the button below to add the Gauged Nut Slotting Files 0.010" width to your wish list.